The WordPress themes are used widely by the web developers for creating the websites in a different niche such as business, magazine, editorial, news etc. You can get free as well as paid WordPress themes from different open source platforms available online. Paid themes always come with add-on features that give a professional touch to your website. However, there are various premium themes enrolled with the WordPress that can help you in launching your website platform in any niche of your choice. The Vlog targets the users who wish to upload the video tutorials, articles on their website. It is said to provide a versatile platform to the user where they can watch videos from YouTube, Vimeo, etc., without any hiccups. The Vlog also has plugins or thumbnail to import the videos directly to the websites and offer various services like - watch later and playlist option to the user. You can check the demo of this theme here. It is listed under "Wordpress Themes" > "News, Magazine & Editorial". It is developed by Meks. The name of the publisher is Envato. 3,503+ users are purchased this already. It was first get released on July 14, 2016. On March 26, 2019, it was last get upgraded. Tags: Video, Youtube Video, Video Blog, Playlist, Gutenberg, Vimeo, Videographer, Podcast, Youtube, Video Theme, Video Portfolio, Video News, Vlog, Video Magazine, Video Blogging. 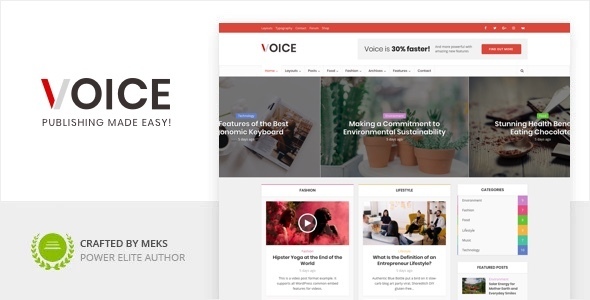 Voice WordPress theme can host a full eCommerce website for you and has the dominant interface for the users to host their own social media platform for the audiences. The theme is robust and is said to offer a wide range of features like header layouts, color, fonts, categories, etc. The theme is fully customizable as per the user requirements. Click here to check the theme demo. It is listed under "Wordpress Themes" > "News, Magazine & Editorial". It is developed by Meks. The publisher name is Envato. More than 6,714 users are purchased this already. It was first get published on December 04, 2014. It was last get upgraded on March 26, 2019. Tags: Fashion, Newspaper, Modern News, Review, Clean, News, Ads, Portal, Material, Blog, Affiliate, Magazine, Rtl, Gutenberg, Rating System. Recommended for you: 10 Awesome Multi-Functional WordPress Themes for your Website 2018. The platform is built for readymade bloggers who do not require any coding. The platform seems to offer lots of functionalities to newbies while they do not need to bother about the backend. It also features lots of options for the customization of the categories within the website. The website blog.modbargains.com is currently using this theme for their WordPress blog. It is listed under "Wordpress Themes" > "News, Magazine & Editorial". The author name is Codetipi. The publisher is Envato. More than 6,907 users are already purchased this. It was first get available on March 20, 2015. It was last get updated on January 08, 2019. 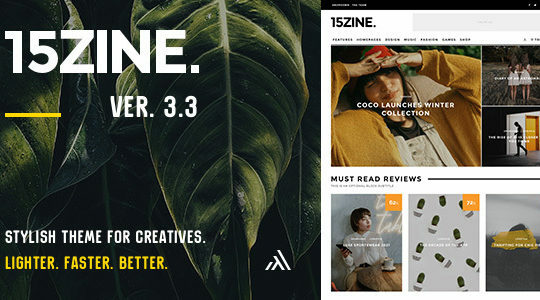 Tags: Creative Theme, Minimalist Magazine, Newspaper, Personal Blog, Review Theme, Newspaper Theme, Review, Magazine, Clean Design, Magazine Theme, News, Fashion Theme, Minimal, Music Theme, Rating. 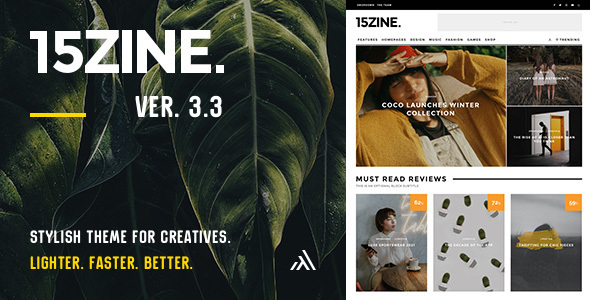 You may also like: 13 Excellent WordPress Themes Great for SEO and Marketing Campaign. A perfect WordPress theme can do a miracle for your website. So go through all above options and opt for one that suits your needs.